Real Madrid managed not to slip today in their away fixture against Espanyol, as they've beaten the locals through a clear 1-4 scoreline. The 3 points won't help them much though, since Barcelona just became the new Spanish champions after also beating Atletico Madrid at the Vicente Calderón. Despite their victory, Real Madrid's fate was sealed earlier today, as Barcelona were crowned La Liga champions after their 1-0 victory at the Vicente Calderón, over the current title holders Atletico Madrid. It was a bittersweet day for Cristiano Ronaldo and his teammates, but especially for the Portuguese star. 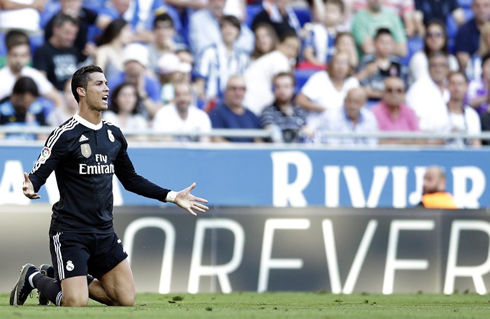 Ronaldo saw his hat-trick (his 7th of the season) helping Real Madrid coming on top of Espanyol in their 4-1 victory, but it was all moot in the end as Barcelona's victory against Diego Simeone's men meant that the Catalan club would be named league champions with still one fixture left to be played. Real Madrid would find their feet and begin to pick up the pace, but they continuously lacked a cutting edge in the final third. It almost felt as if the players had given up, now resigned to the fact that winning La Liga seemed virtually impossible. Still at halftime and with the score in both Madrid's and Barça's games at 0-0, there was a glimmer of hope for Los Merengues. And that glimmer of hope would turn into a spark almost 15 minutes after halftime. After being played through by Karim Benzema, Cristiano Ronaldo would hit a low left-footed shot through the legs of Espanyol goalkeeper Kiko Casilla. The goal would give Madrid a brief lifeline, as they eagerly awaited the results of the Barcelona game at the Calderón. Unfortunately for Real Madrid, their fate would be sealed a few minutes later, when Messi opened the scoring against Atletico. Still, Madrid had their own business to take care of and things we're looking much better from their side of things. A horrible error by Keylor Navas (given a rare start over Iker Casillas) led to a goal for subsititute Christian Stuani. After controlling a backpass, Navas got a bit too fancy with the ball and had it disposed, eventually leading to an easy tap in for Espanyol. Despite Madrid's protestations that their Costa Rican goalkeeper was fouled, the goal stood. But that kicked Real Madrid into high gear and they came storming right back. Just six minutes later, they would seize the lead again, this time after a brilliant left footed strike inside the box by Marcelo. Some good combination play on the left between the Brazilian and Cristiano Ronaldo, led to a neat layoff to Marcelo. 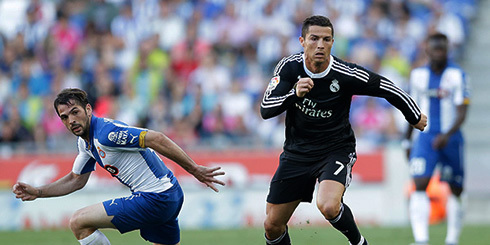 He wasted no time and blasted it into the top corner of Kiko Casilla's net. And just four minutes later, Madrid would effectively seal off the game. 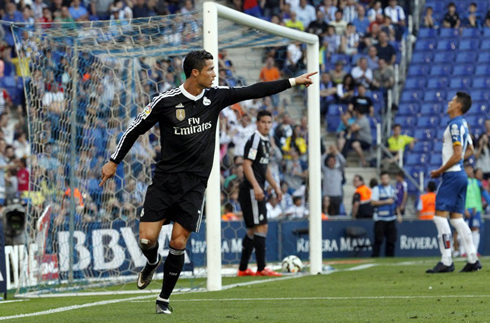 Following Chicharito's run in the box, a trailing Ronaldo was able to run onto the ball and slot it home. 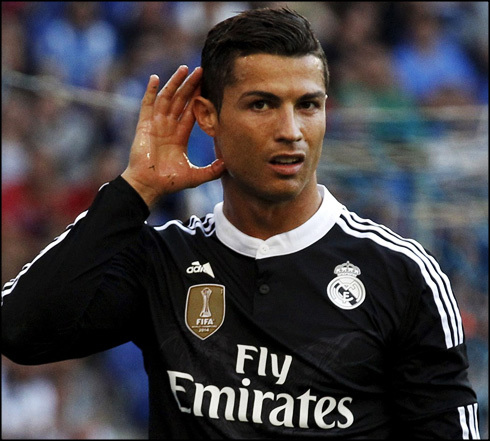 And it wouldn't be too long before Ronaldo would net his hattrick and get his 45th goal of the season. The Portuguese forward finished off a header from a James Rodriguez cross, which now puts him at the 310-goal mark for Real Madrid. But all in all, it will go down as a disappointing year for a Madrid team that showed so much promise early on. The last game will now be inconsequential. so hopefully we will see a full debut for Martin Odegaard. 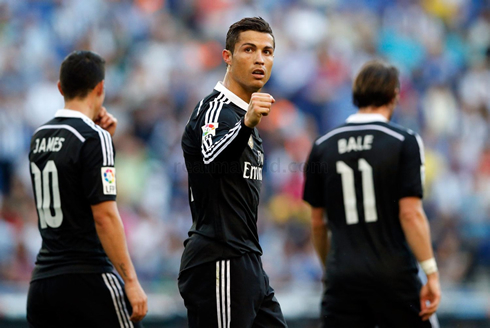 Cristiano Ronaldo next game will be for La Liga against Getafe, on the 23th of May of 2015. You can watch Juventus live stream, Real Madrid vs Getafe, Barcelona vs Deportivo, WBA vs Chelsea, Arsenal vs Sunderland, and Borussia Dortmund vs Werder Bremen, all matches provided from our sports football section.